SolarMax LED showcased innovative products at the League of California Cities Annual Expo at the Long Beach Convention Center in September 2018. Through California’s largest 3-day premier event, SolarMax LED presented a clear view of what technology has to offer and how more efficient services can be achieved. SolarMax LED featured products and technology such as the SolarMax iE Series LED Roadway lighting and wireless control system that provides both lasting performance and cost saving energy efficiency for municipalities. A dashboard enables the cities to track and monitor the system performance. The SolarMax Wireless Intelligent Solar Energy Storage System (WISESS) is another product that attracted many visitors at the show due to its advanced technology – a pioneering work in the solar and lighting storage industry. 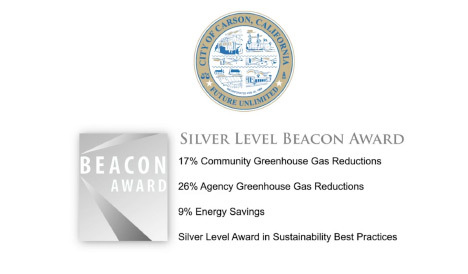 SolarMax LED was honored to witness the City of Carson winning a Silver Beacon Award at the League of California Cities Annual Conference for its achievements in creating healthier, more vibrant and sustainable communities. SolarMax LED assisted the City of Carson in reducing its energy expenditure by replacing over 1,000 lights with LED fixtures throughout 9 parks and 4 facilities in March 2018. Through this lighting project, the City improved illuminance as well as energy savings. The City expects to reduce greenhouse gas emissions by 17% and save 720,000 kWh annually. SolarMax LED strives to help more municipalities decrease energy usage, reduce carbon footprints and move one step closer to becoming a smart green city.